How 24V MDR conveyors work. Zero pressure accumulation explained. You are here: Home / News / News / How does 24V MDR conveyor work? Sometimes a picture is worth a thousand words. Or in this case, a video. 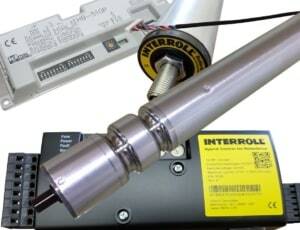 In showing how 24V MDR conveyor (or motorized roller conveyor) works the benefits are easy to see. Ultimation’s internal sales team thought a quick demo was the easiest way to show how 24V MDR conveyors work. Ultimation Internal Sales Manager, Jenni Collins, explains the benefits. “It’s actually pretty simple. This ten foot section in the video has two motorized rollers, three photo eyes to detect the boxes and one Interroll multi-control card. 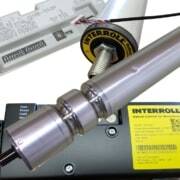 The motors are connected to the other rollers with Durabelt o-rings. The control card is constantly checking if space is available at the next zone of the conveyor. As soon as space opens up, the 24V MDR conveyor sends the next package along. If you would like to learn more about how 24V MDR conveyors work, you can contact Jenni or any of our sales team. We can help take the mystery out of MDR systems for you!